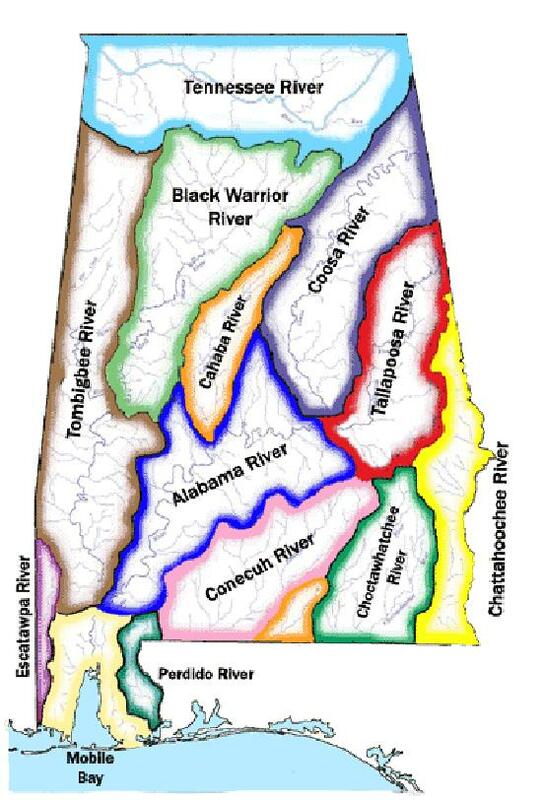 The Alabama Rivers Alliance was formed out of the efforts of its predecessor – the Alabama State Rivers Coalition. The Alabama State Rivers Coalition was formed in 1993 and led by the Cahaba River Society, Alabama Chapter of the Sierra Club, Lake Watch of Lake Martin, Alabama Citizen Action, Friends of the Locust Fork River, and Alabama Environmental Council. In 1995 the Cahaba River Society hired an organizer for the Coalition and Policy Director for the Cahaba River Society’s state policy programs. After a year of working for the Cahaba River Society, the founding Board of Directors of the Alabama Rivers Alliance was convened in September of 1996. Soon thereafter the organization chose its mission, incorporated, developed a strategic plan, and applied for and soon received its 501(c)(3) tax-exempt status. Still using the Cahaba River Society as its fiscal sponsor, the fledgling Alabama Rivers Alliance moved into a new office in December of 1996. On July 1, 1997, the Alliance started its first fiscal year operating without a fiscal sponsor. Today, the Alabama Rivers Alliance has four full time staff and an annual operating budget of more than $300,000. We are privately funded and all of our work is accomplished with the financial support of people like you. Please donate today. 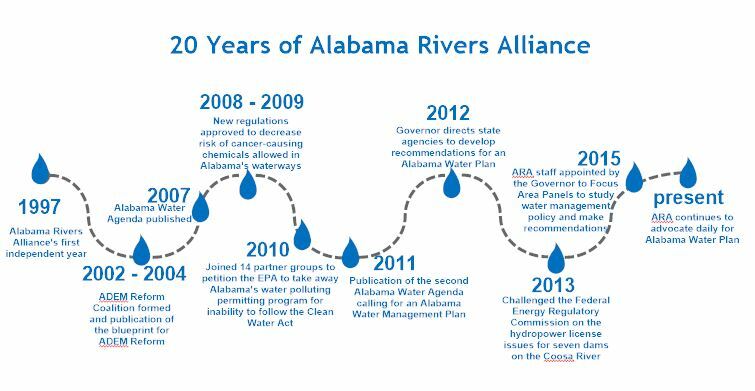 Since its founding, the Alabama Rivers Alliance has worked alongside multiple stakeholders to accomplish multiple shared successes. Developed multiple publications focused on watershed health, including reports on the Black Warrior River, Choccolocco Creek, Hatchet Creek and Hurricane Creek. Assisted in building, uniting, and supporting more than 70 grassroots watershed organizations throughout the state. Hosted the annual Watershed Leadership Conference to fulfill the goal of “building, supporting, and uniting” grassroots organizations. Working with the Upper Chattahoochee Riverkeeper and other partners, formed the Tristate Conservation Coalition to protect downstream and in-stream interests throughout the water negotiations between Alabama, Georgia, and Florida. By winning a federal court case, temporarily defeated a permit authorizing the ill-conceived Duck River Dam. Working with the Legal Environmental Assistance Foundation, sued Sloss Industries and the US Environmental Protection Agency, which eventually resulted in the largest fine in state history, reduction of pollution, and the upgrade of a stream classification for Five Mile Creek in Jefferson County. Worked with local advocates to defeat a proposal for a jail on Turkey Creek, which resulted in the creation of a park on the creek that will help to protect the endangered Vermillion darter. Working with a coalition throughout Jefferson County , defeated the aptly named, 12-foot diameter “supersewer” that was planned to tunnel under the Cahaba River 15 times. Thanks largely to the assistance of American Rivers, prevailed in a significant federal court case, establishing firmly that the Clean Water Act applies to water releases from hydropower dams. Working with the Friends of the Locust Fork and other partners, protected the Locust Fork River from multiple water supply dam proposals. Implemented an acid mine drainage reclamation project in the Hurricane Creek watershed. Working with the Friends of Hurricane Creek through the state courts, reversed and denied an ill-advised coal-mining permit issued by ADEM in the Hurricane Creek watershed.